The Windmill Cafe is open for business! ‘I relished every moment of this story … definitely not one to be missed’ Emma, Shaz’s Book Blog As Rosie Barnes serves glasses of tangy lemonade and ice-cold prosecco at her summer garden party, she couldn’t be happier. The Windmill Café, with its peppermint green sails is a roaring success and has given Rosie a chance to escape the heartbreak of her busy life in London. But then disaster strikes when popstar Suki Richards is taken unexpectedly ill at the party. Now all eyes are on Rosie…have her famous raspberry cupcakes poisoned her most high-profile guest? Or is someone else trying to damage Suki’s chance of stardom? 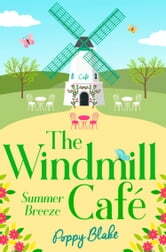 If Rosie wants to save her picture-perfect life, and the reputation of her beloved Windmill Café, she’s going to have to get to the bottom of the mystery…and fast! A pleasant read, touching on life with a bit of romance and a who dunnit twist.